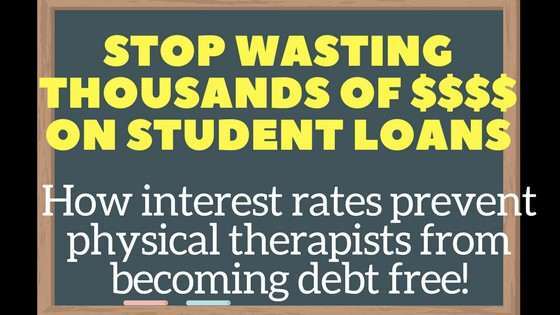 How interest rates prevent physical therapists from becoming debt free! There are many things that I wish I had learned in physical therapy school, both professionally and financially. In this post, I’ll discuss how interest rates prevent physical therapists from becoming debt free. I’ll also go over what YOU NEED TO KNOW as a new graduate (heck learn this now while you are still in school) and see step by step which repayment plan is best for you! Interest On Student Loans Compounds Rapidly, Costing You Thousands Of Extra Dollars A year! You Need To Make A Plan on Day 1 of Graduating At The Latest – Ideally You Should Have A Plan Before Applying To Graduate School! You Don’t Need To Follow The Traditional Perspectives. There Are Many Acceptable Ways To Use Your Earnings And Resolve Your Debt. Don’t Let Anyone Tell You There Is Only One Way! In 2014, I graduated with my doctorate in physical therapy and roughly $150,000 in student debt! During school I worked odd jobs, obtained scholarships, and lived as reasonably as possibly. I zeroed out my bank account and sold all my stocks to pay for PT school (I didn’t have very much, just around $10,000 saved up from summers working and a year of being a substitute special education teacher)! Yet, I still had enough debt to own a small house in the Midwest upon graduation! Fast-forward four years later and there is still so much that I am learning about the physical therapy profession and about managing my student loans. However, I tried to think of the three most impactful lessons that I have learned so far, specifically, about my student loans! In 2014, as I stated earlier, I graduated with about $150,000 in debt at an average interest rate of roughly 7.0%. What does this mean? I had no idea the impact this interest rate would have on me when I graduated! The number looked small enough right! But now, that 7% really makes me mad because that 7% is making it very hard to pay off my debt! What does it mean to have a 7% interest rate on $150,000 in student loans? Lets take a look! 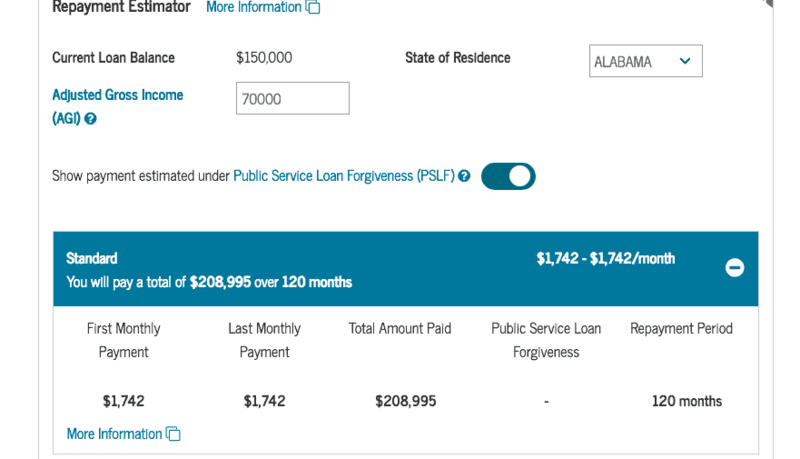 Below is a screen shot of a loan balance of $150,000 at 7% interest for someone who earns $70,000 after various taxes ($70,000 is their adjusted gross income or AGI). This screen shot was taken using the repayment estimator provided by the government via the website: studentloans.gov. I highly recommend their website as it directly links you to your student loans to give you the most update loan balance and calculations. Using this calculator, I’m going to show you how your interest rate affects your loans and what your loan looks like under different repayment plans! The standard repayment plan is a repayment plan that calculates the loan payments you need to pay off your loan in 10 years in full. Basically, if you are trying to pay off your loans as fast as possible, this is likely the plan for you. Holy cow, that’s a ton of money paid to interest! You see that even if you devoted almost $2000 a month, after 10 years you would have paid almost $60,000 extra to your loans due to interest! How many of us are actually attacking our loans aggressively and doing the standard repayment plan? Before we take a look at the other repayment options, I want to go into detail as to how hard it will be to pay off this loan! Many of us cannot afford $1500 – $2000 month payments! If you are thinking you can, then here is a cost of living breakdown for you! Ok what does this mean for how much you need to earn to afford to pay off your $150,000 loan? $4000 x 12 months equals $48,000. That means that to live basically as well as pay your loan payment, you need to earn at more than $48,000. The above also assumes a lot. It assumes you don’t live in an expensive apartment and it assumes you never travel any where or have any major car or health costs. It also assumes you don’t have any children. But you have to earn MORE than $48,000 because of taxes! On $70,000, according to tax form calculator, after taxes you will actually earn only $53,000. Now again, this assumes many things including that you are a single individual with no children. So if you made $70,000 annually, which is really $53,000 after taxes, then after your cost of living and loans then you would keep only $ 5,000 a year!!!! What about retirement, what about trying to afford a home, a car, a vacation! What is you want to start a family? At $70,000, after taxes with a $150,000 loan that you are trying to pay off in 10 years, you are literally saving NO money. Yes, you can pay off a $150,000 loan in 10 years, but you will be left with NO savings, NO life, and No retirement! I said earlier than many of us already sense that we can’t afford the standard repayment plan. Its sad, but many new graduates and even seasoned therapists wont earn $70,000! I lived in Los Angeles as a new graduate, I was lucky to find a contract position that paid me very well, but I had other offers for only $65,000! Even after 1 year of experience, I was still receiving offers for positions that only paid $65,000! It’s a hard reality that PTs are graduating with loans that they will be very difficult to pay off with out significant sacrifices. Now, yes, you can pay off your loans by buckling down and putting every last dime you earn into your loans. But you didn’t go to PT school only to continue to suffer, sacrifice, and not live your life! I have some other ways that will help you enjoy your career and life without having to regret going to PT school! First, let’s go into what would happen if you used other repayment plans…. Here’s the REPAYE plan. This is where you pay until 25 years and then the rest is forgiven. Note that you have to pay taxes on what you are forgiven! Here’s the PAYE plan. This is where you pay until 20 years and then the rest is forgiven. Note that you have to pay taxes on what you are forgiven! 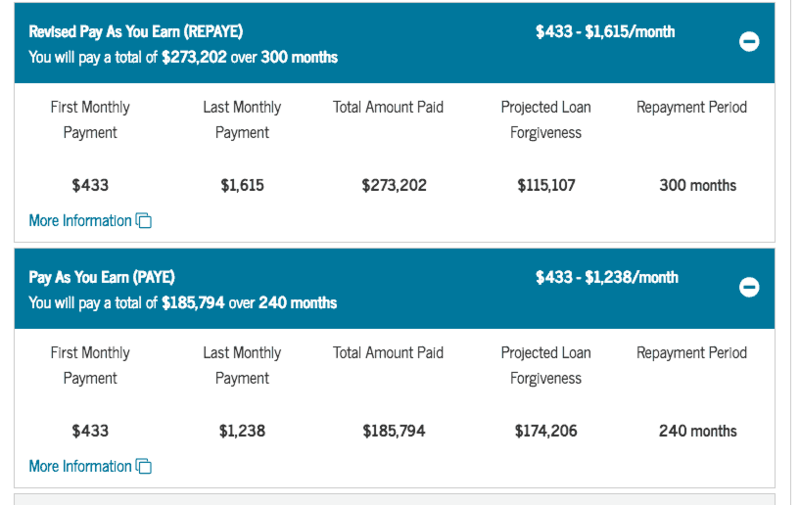 Which Repayment Plan is Best for You? This question is really tough because all these calculations take into account a lot of assumptions. You have to ask yourself what your goals are and can you handle the burden of your loan for 10-20 years? If you want to repay your loan as soon as possible, then as you can see with the high interest rates, it may be best to choose a standard repayment plan and try to pay as much as possible into your loan. If you know this burden is too much, then you can look into alternative methods such as finding a non profit and doing income based repayment plans such as PAY or REPAYE. If possible, PAYE is a superior plan over REPAYE as you only pay for 20 years instead of 25 years, saving you in this example $117,000! I just showed you a lot of math. Don’t worry if you don’t know what a lot of numbers were, I didn’t either when I first graduated! What is interest? When you borrow money, the bank or lender charges you interest, this is usually a percentage of the unpaid loan amount borrowed. What is my interest rate? To find your interest rate, you can call your loan servicer which should walk you through your interest rate and what that means for your loans. You can also look at any monthly bill which should state your interest rate. Average rates are between 5-7% for various federal Direct loans. What assumptions are being made in many calculators including this one from studentloans.gov? Monthly payments: This calculator monthly payment estimates are based on your adjusted gross income (AGI) as well as an assumption that your income will grow at 5% a year. That’s why when you look at the payments, you see 1st month and last month are quite different. The government assumes you will be growing in your career. To discuss actual monthly payment amounts, contact your loan servicer or you could plug in any raises you anticipate. Repayment Period – It assumes that you’ll pay continuously throughout the repayment period with no breaks for deferment or forbearance and that you will follow the repayment rules such as paying 25 years for REPAYE and 20 for PAY. Discretionary Income – It assumes that your income will grow 5% each year, that your family size will remain the same during the life of the loan, and that the poverty guidelines will increase based on the Congressional Budget Office’s estimation of inflation. Variable interest rates – Loan interest rates may change, but this calculator assumes they will stay fixed. Changing the loan interest rate will change how much you owe and you can adjust that to try to predict what you loan would look like if you refinanced. Adjusted Gross Income: This is what your loan’s monthly fee is comprised of. Whenever you talk about taxes and income estimation, there are a lot of assumptions that must happen. In this calculation, I assumed that you had no children – if you did have children you would see what you owe decrease. This also assumed you had an AGI of $70,000. You may have a higher or lower AGI based on deductions, retirement contributions and overall earnings. 2. You Need To Make A Plan on Day 1 of Graduating At The Latest – Ideally You Should Have A Plan Before Applying To Graduate School! I hope the calculations above illustrate how rapidly student loan interest rate can compound and end up costing you tens of thousands more over the life of your loan. Your loan amount, in combination with this interest, make paying off your loan difficult without severe sacrifices. That’s why I encourage you to have a plan as far in advance as possible for how you are going to combat your loans! The quicker you decide, the quicker you can attack the principal or the meat of the loan to prevent excess interest from accruing. If you decide on seeking forgiveness, then in what capacity will you be forgiven. If you are seeking forgiveness in the PAYE or REPAYE plans then note that interest will add to your total loan amount which will then be taxed upon forgiveness. If you seek forgiveness from PSLF, then you don’t have to worry about the growth of interest, because what you earn will cap how much you pay over the life of the 10 year loan and you will not owe any tax on what is forgiven. It would be ideal if you had a plan even before you entered into graduate school! That way, if you knew you want to pay off the loan ASAP, then you could try to work during school. You could try to seek as many scholarships as possible and live as frugally as possible. You could take private loans instead of public for lower interest rates. I didn’t have a plan for my loans until 2 years after I graduated. Its tough to create a plan. I mean, how do I know as a new graduate what I want to do with my career? Why should you be limited to just working in non profits? It took me a while because I did not have clear direction of what myself, my family and my future needed. But, looking back, I wish I had made a plan because my loan balance would be lower and would have enabled me increased choices with how to conquer my debt. Basically, don’t be like me and have interest creep up on you! Try to be as proactive as you can! 3. You Don’t Need To Follow The Traditional Perspective. There Are Many Acceptable Ways To Use Your Earnings And Resolve Your Debt. Don’t Let Anyone Tell You There Is Only One Way! Even with the income based repayment plans, you are paying in the upper $200,000- 300,000 to become a physical therapist! This is insane! And yet, our salaries remain low. On average, salaries earn $69,220 according to payscaleor 83,034 according to www1.salary.com. As I showed in the calculation in the standard repayment plan, to pay off your debt in 10 years at a 70,000 income, you really aren’t going to be able to live or even retire! As the creator of Debt Free PT, I challenge you to think about these other methods to conquer your loans! When I graduated and became a contract therapist, and then a traveling physical therapist, I felt like I was judged by piers. Like I wasn’t valuing my career because I took non traditional positions. For those people who judge you, I say they aren’t your true friends! You can still help many people in non traditional settings! You can still grow you experience and have quality treatment sessions! I emplore you to prioritize your career with your finances. I don’t believe you have to choose one over the other! You can still be a great therapist and help many people as a traveling or contract PT. As a traveler, you can explore a variety of settings, treat along side a variety of therapists thereby growing your skill set, and have fun traveling the nation! As a contract therapist, you are working in one spot for usually an annual contract, which may or may not be renewed at the end of the year. In both of these positions, you are treating just as if you were in a permanent position, but with much higher salaries! These higher salaries could enable you to pay off your debt faster, grow your retirement, or build a family! If you want more information on any of these career routes feel free to comment or contact me! You can have a future in physical therapy or allied health, but you just have to organized, resilient, and a little creative!